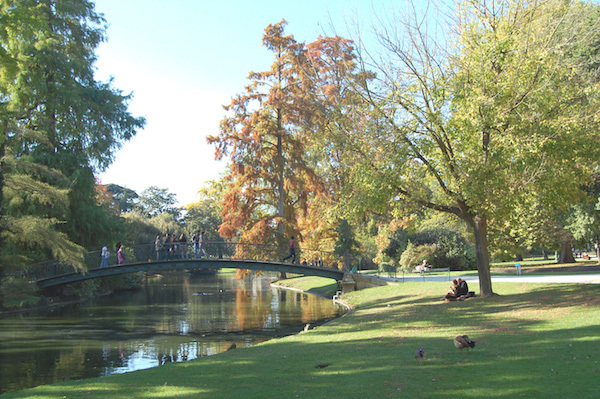 This run explores three lovely parks centrally located on the left bank of the Garonne River in central Bordeaux. This 7.3 km route incorporates Jardin Public, Parc Bordelais, and the smaller Parc Rivière. The centerpiece is where we start our run — the Jardin de Public — created in 1746 and lined by townhouses, stately buildings, and ancient trees. It’s a small park, so you’ll do ~0.5 km to the western end, exiting on Rue David Johnston. Take this for 1 km, and after the road turns in to G. de Gaulle, LEFT on Ave. du Général Leclerc, into the larger Parc Bordelais, a grand park with gorgeous older trees and grand alées. A loop of the park is ~1.5 km (numerous additional paths to add on). Exit to where you entered, and return via Rue David Johnston. Option: Add on the small but pretty Parc Rivière by going LEFT on Rue Camille Goddard off Rue David Johnston. This adds ~1 km. Add-Ons: Numerous options to add-on or combine with our other central Bordeaux routes.